For his first solo show, School of Fine Art student Chanoh Heo wanted to do something different. 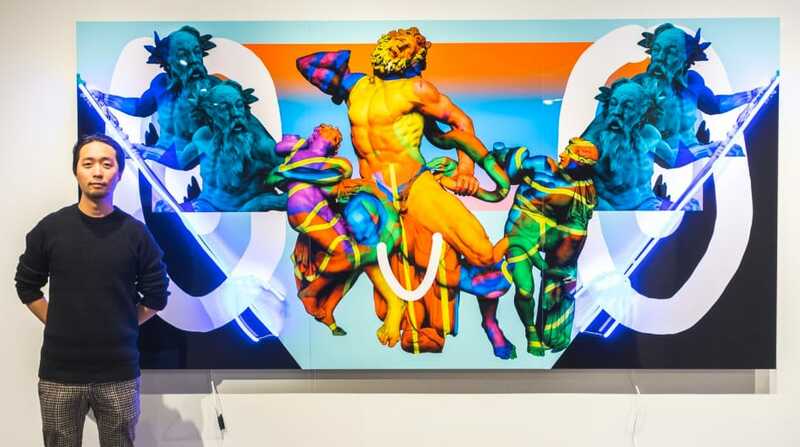 High End, Heo’s recent show at the Academy’s Atelier Gallery, presented 10 works in which allusions to famous sculptures burst with eye-catching shocks of color, childlike drawings and neon lighting. Very different, indeed. Juxtapositions between old and new resonate at the heart of High End. Each work hinged on high art sculptures long ingrained into public consciousness, like Michelangelo’s “Pietà,” the Capitoline Wolf, the Venus of Willendorf and Giambologna’s “Hercules and Nessus,” to name a few. Yet in these works Heo applied a striking pop-art twist: Heo added vivid hues, repeated patterns and drawings—such as smiley faces and animals—that recall pop art and post-modernism. The works are printed on aluminum; some have neon lighting attached. Guests at the Academy Atelier Gallery exhibition opening of “High End” take in artist Chanoh Heo’s “Aurelius.” Photo by Adrian Childress. Heo’s intent was to minimize the space between art and viewer. As his artist statement for the show stated, the sculptural images he based these works on—images copied over the centuries—have become so familiar that “their sacredness and original intent” has diminished. 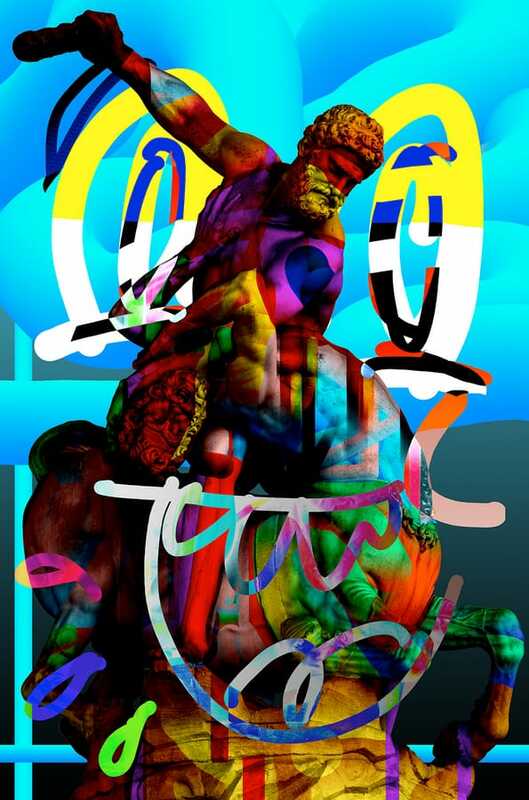 Heo emphasizes that he’s never seen these celebrated sculptures in person. Yet, like many people, he knows the works and their cultural weight. By grounding them within pop art, he aimed to make them more accessible. He likens the brilliant colors and neon lighting to a flame luring his viewers (like moths) to high art subjects that may have not felt approachable before. The medium he employed for the works in the exhibition is also a jump from his typical approach. For the show, he used a technique called dye sublimation to print on aluminum. After the opening, he wrote that the print medium is more of a commodity and more familiar to most audiences. A view of Chanoh Heo’s “The Three Graces” from outside the Atelier Gallery. Photo by Alleister Flores. Atelier Gallery Manager Kevin Goring first noticed Heo’s work at the university’s student Spring Show in 2018. 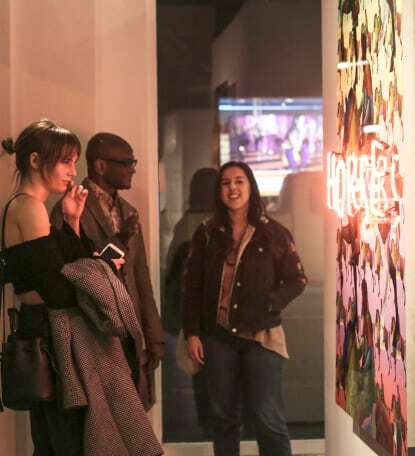 There, Heo’s featured work also showcased a vibrant color palette and iconic images. 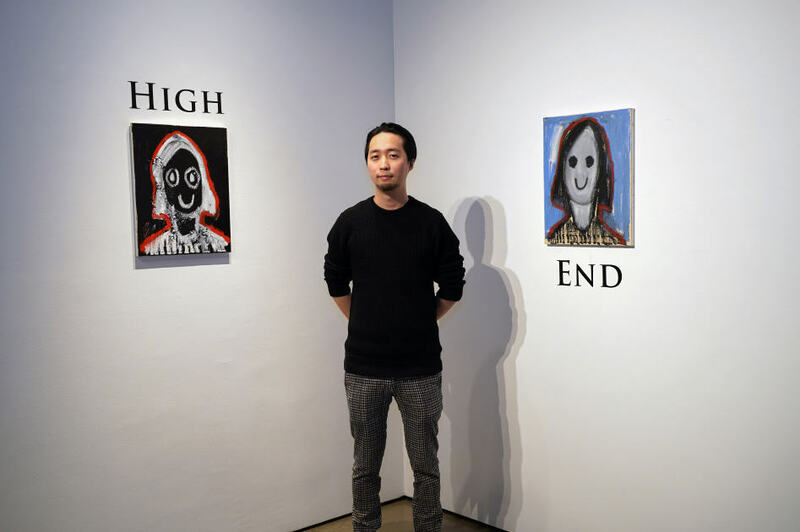 Heo earned his BFA from the Academy in 2018 before pursuing an MFA. Originally an Animation student, he soon pivoted into fine art painting. Branching out again—from the comfort zone of classical painting—takes courage, says Heo’s former teacher Drew Price. 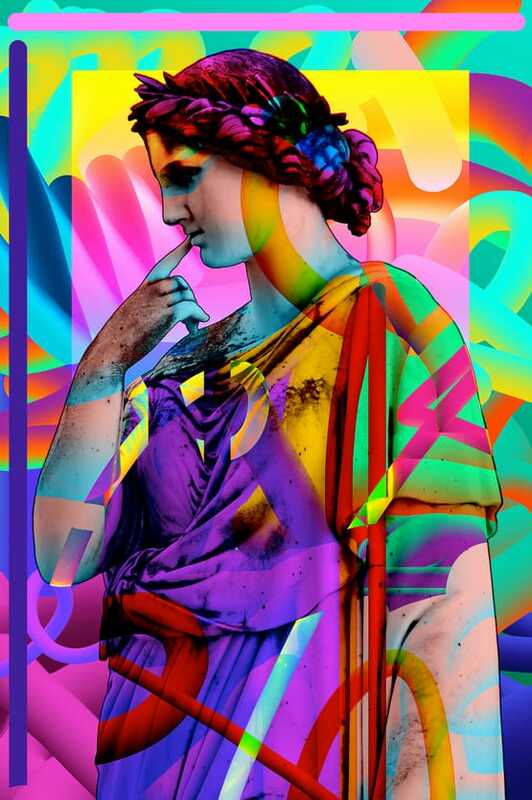 “Using these different kinds of visual vocabularies, from classical to very pop and modern, kind of recontextualizes these classical, iconic works of art. I think that works out really well. And then you throw the neon in there, and it really supports that idea,” Price says. Goring notes that High End also connects to a key cultural moment in San Francisco. “Especially in this city, I can see pop art filling a lot of gaps,” he says, offering how nearby hotels or tech companies would appreciate this hip aesthetic.